Metamodelling of conceptual data modelling languages is nothing new, and one may wonder why one would need yet another one. But you do, if you want to develop complex systems or integrate various legacy sources (which South Africa is going to invest more money in) and automate at least some parts of it. For instance: you want to link up the business rules modelled in ORM, the EER diagram of the database, and the UML class diagram that was developed for the application layer. Are the, say, Student entity types across the models really the same kind of thing? And UML’s attribute StudentID vs. the one in the EER diagram? Or EER’s EmployeesDependent weak entity type with the ORM business rule that states that “each dependent of an employee is identified by EmployeeID an the Dependent’s Name? Ascertaining the correctness of such inter-model assertions in different languages does not require a comparison and contrast of their differences, but a way to harmonise or unify them. Some such models already exist, but they take subsets of the languages, whereas all those features do appear in actual models  (described here informally). Our metamodel, in contrast, aims to capture all constructs of the aforementioned languages and the constraints that hold between them, and generalize in an ontology-driven way so that the integrated metamodel subsumes the structural, static elements of them (i.e., the integrated metamodel has as them as fragments). Besides some updates to the earlier metamodel fragment presented in [2,3], the current version [4,5] also includes the metamodel fragment of their constraints (though omits temporal aspects and derived constraints). The metamodel and its explanation can be found in the paper in An ontology-driven unifying metamodel of UML Class Diagrams, EER, and ORM2  that I co-authored with Pablo Fillottrani, and which was recently accepted in Data & Knowledge Engineering. Methodologically, the unifying metamodel presented in An ontology-driven unifying metamodel of UML Class Diagrams, EER, and ORM2 , is ontological rather than formal (cf. all other known works). On that ‘ontology-driven approach’, here is meant the use of insights from Ontology (philosophy) and ontologies (in computing) to enhance the quality of a conceptual data model and obtain that ‘glue stuff’ to unify the metamodels of the languages. The DKE paper describes all that, such as: on the nature of the UML association/ORM fact type (different wording, same ontological commitment), attributes with and without data types, the plethora of identification constraints (weak entity types, reference modes, etc. ), where can one reuse an ‘attribute’ if at all, and more. The main benefit of this approach is being able to cope with the larger amount of elements that are present in those languages, and it shows that, in the details, the overlap in features across the languages is rather small: 4 among the set of 23 types of relationship, role, and entity type are essentially the same across the languages (see figure below), and 6 of the 49 types of constraints. The metamodel is stable for the modelling languages covered. It is represented in UML for ease of communication, but, as mentioned earlier, it also has been formalised in the meantime . The DKE paper also puts it in a broader context with examples, model analyses using the harmonised terminology, and a use case scenario that demonstrates the usefulness of the metamodel for inter-model assertions. Every now and then, I get side-tracked from what I was (supposed to be) doing. This time, it was a result of the combination of preparing ICPC training problems, preparing for a statistics tutorial for the postgraduate research methods, and a conversation from last week on an isiZulu corpus with Langa Khumalo from UKZN’s ULPDO (and my co-author on several papers on isiZulu CNLs). To make a long story short, I ended up sourcing some online news articles in isiZulu and writing a little python script to count the words and top-k words of the news articles to get a feel of what the most prevalent topics of the articles were. Simple basicCorpusStats.py that one can make already just by going through the first part of ThinkPython (in case you’re unfamiliar with python). Note: ilanga doesn’t have articles online, and therefore was not included. Note 2: for copyright issues, I probably cannot share the txt files online, but in case you’re interested, just ask me and I’ll email them. Isolezwe had, on average, 265 words/article, whereas news24 had about half of that (110 and 134 on Saturday and Sunday, respectively). The top-20 of each is listed at the end of this post (the raw results of News24 had “–” removed [bug], as well as udaba and olunye [standard-text noise from the articles]). Comparing them on the August 8 offering, Isolezwe had people saying this that and the other (ukuthi ‘saying/to say’ had the highest frequency of 60) and then the police (amaphoyisa, n=27), whereas News24 had amaphoyisa 27 times as most frequent word, then abasolwa (‘suspects’) 11 times that doesn’t even appear in Isolezwe’s top-20 most frequent words (though the stem –solwa appears 9 times). The police is problematic in South Africa—they commit crimes and other dubious behaviour under investigation (e.g., Marikana)—and more get killed than in may other countries (another one last week), and crime happens. But not on a public holiday, apparently: News24 had only one –phoyisa on Aug 9. While I hoped to find a high incidence of women, for it being Women’s Day on August 9, none of –fazi appeared in the News24 mini-corpus of 1353 words of the 10 front page articles; instead, there was a lot of saying this that and the other (ukuthi had the highest frequency of 37), and little on suspects or blaming (-solwa n=3). While ukuthi is the infinitive, there are a gazillion conjugations and things agglutinated to it that is barely clear to the linguists on how it all works, so I did not analyse that further. Amaphoyisa, on the other hand, as a noun (plural of ‘police’), has fewer variations. In the Isolezwe mini-corpus, –phoyis– (the root of ‘police’) appeared 47 times, including variants like lwamaphoyisa, ngamaphoyisa, yiphoyisa, i.e., substantially more than the 27 amaphoyisa. If I were to create a wordle, they’d be missed unless one uses some stemmer, which doesn’t happen to be available and I didn’t write one (just regex in the txt). By the same token, News24’s mention of the police on August 8 goes up to 28 with –phoyisa, and as close second the blaming and suspects (-solwa, n=27). The lack of a stemmer also means missing out on all sorts of variations on imali (‘money’, n=11) in the isolezwe articles, whereas its stem –mali pops up 29 times, due to, among others, kwemali (n=5), mali (n=3), yimali (y- functioning as copulative in that sentence, n=1), ngezimali (n=1) and others. Likewise on person/people (-ntu) for which n=17 that are distributed among abantu (plural) umuntu (singular), nabantu (‘and people’), among others. Last, the second most frequently used word in News24 on August 9 was njengoba (‘as’, ‘whereas’, ‘since’), primarily due to the first article on the sports results of the matches played. So, with all that background knowledge, Isolezwe’s wordle would be, in descending order (and in English for the readers of this blog): say, police, money, people. News24 on August 8: police, suspect/blame, say (two variations, n=9 each). News24 on August 9: say, as/since (and then some other adverbs). This dabbling resulted in more problems and questions being raised than answered. But, for now, it’s at least still a bit of a peek into the kitchen of news in a language that I don’t master as well as I want to and should. It wasn’t useful either for the ICPC problem setting or the stats tutorial, nor is a 5123-word corpus of any use, but it was fun with python at least and satisfying at last a little of my curiosity, and perhaps it spurs someone to do all this properly/more systematically and on a grander scale. For the isiZulu speakers: it’s surely still up to you to read whichever news outlet you prefer reading. There is some material on that (among others, [1,2]), though, but it’s mostly theoretical or very proof of concept, rather than the easy reuse of tools like for English, and the example rule in  isn’t right (it’s umfana, not umufana; the longer prefix with the extra –u– is used when the stem is one syllable, like –ntu -> umuntu). Starting from multilingual knowledge representation in ontologies and an eye on linguistic linked data and controlled natural languages, we had developed a basic ontology for the Bantu noun class system  to link with the lemon model . The noun class system is alike gender in, e.g., German and Italian, but then a bit different. It is based on semantics of the nouns and each Bantu language has some 12-23 noun classes. For instance, noun classes 1 and 2 are for singular and plural humans, 9 and 10 for animals (singular and plural, respectively), 11 for inanimates and long thin objects (e.g., a telephone cable), and class 14 has abstract nouns (e.g., beauty). Each class has its own augment or augment+prefix to be added to the stem. None of the other linguistic resources, such as ISOcat or the GOLD ontology, dealt with them, so, lemon did not either, but we needed it. The first version of the ontology we introduced in  had its limitations, but it mostly did its job. Mostly, but not fully. Lemon needs that morphology module and then some for the rules. The ontology did not fully satisfy Bantu languages other than Chichewa and isiZulu. With the knowledge of the latter only, it was more alike a merged conceptual data model, for it was tailored to the two specific languages. Also, it wasn’t aligned to other models or ontologies, thus hampering interoperability and reuse. We didn’t have any competency questions or cool inferences either, because our scope then was just to annotate the names of the classes in an ontology. Hence, it was time for an improvement. language specific, which singular (plural) noun class goes with which plural (singular) noun class: while the majority neatly has a pair of successive odd and even numbers (1-2, 3-4, 5-6 etc), this is not always the case; e.g., in isiZulu, noun class 11 does not have noun class 12 as plural, but noun class 10 (which has its own augment and prefix). Then, besides the interoperability and reuse requirements, we’d needed to distinguish between language-specific axioms and those that hold across the language family. To solve all that, we developed a framework, reusing the pyramid structure idea from BioTop  and the so-called “double articulation principle” of DOGMA , where the language-specific axioms are at the level of DOGMA’s conceptual model, for they add specific constraints. More details are described in the recently accepted paper “An orchestration framework for linguistic task ontologies” , to be presented as the 9th Metadata and Semantics Research Conference (MTSR’15), to be held from 9 to 11 September in Manchester, UK. My co-author Catherine Chavula will be attending MTSR’15 and present our paper, hoping/assuming that all those last-minute things—like visa and money actually being transferred to buy that plane ticket—will be sorted this month. (Odd ‘checks and balances’ that make life harder and more expensive for people outside of a visa-free zone and tied to a funding benefactor is a topic for some other time.). The set of ontologies (in OWL) is available in NCS1.zip from my ontologies directory. 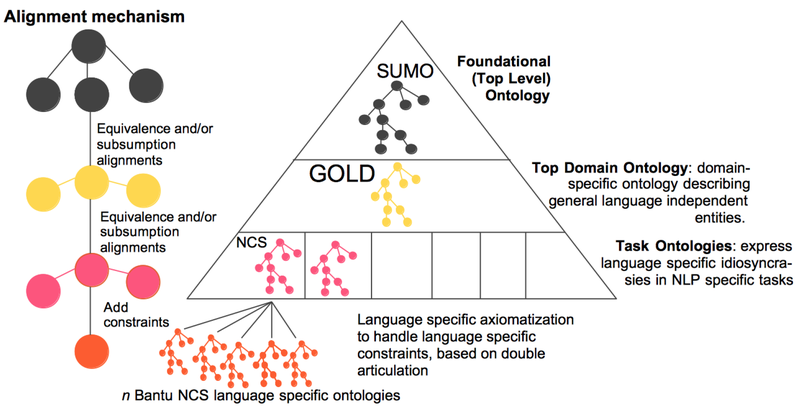 It contains the goldModule—a module extracted from the GOLD ontology for general linguistics knowledge and that is aligned to the foundational ontology SUMO—the NCS ontology, and three languages-specific axiomatizations for the noun classes, being Chichewa, isiXhosa, and isiZulu (more TBA). The same approach can be used for other linguistic features in other language groups or families; e.g., instead of the NCS, one could have knowledge represented about conjugation in the Romance languages (Italian, Spanish etc. ), and then the more precise axiomatization (conceptual data model, if you will) for constraints unique to each language. p.s. : Bantu languages is the term used in linguistics, so that’s why it’s used here. Elsewhere, they are also called African languages. They’re not synonymous, however, as the latter includes also other, non-Bantu, languages, as it can designate any language spoken in Africa that may have a wholly different grammar, hence, the difference linguists make to avoid misinterpretation.